I’ve said it many times in the past, but one of my favorite market idioms is worth repeating here today, and it goes a little something like this — hope is not an investment strategy. Yet it seems that hope is what’s fueling today’s rally, as stocks got up off of the canvas after last week’s drubbing. The buzz on the trading floors is that the Federal Reserve and central banks around the world will undertake some sort of coordinated effort to try and inject liquidity into the global financial system. Presumably, this effort would stave off a potential global recession. Now, I am not sure how this potential intervention would be accomplished. From a long-term perspective, what the world needs now is not an influx of cheap fiat currency or reduced interest rates. Nevertheless, a move by the Fed, and/or a move by the central banks around the world to loosen the purse strings on capital would be perceived as a positive for stocks. Hence, the buying we’ve seen in today’s early trading. Despite today’s gains, one look at the charts of the following three major indices tells us that stocks still are mired in a steep sell-off. That sell-off requires you to approach this market with extreme caution. 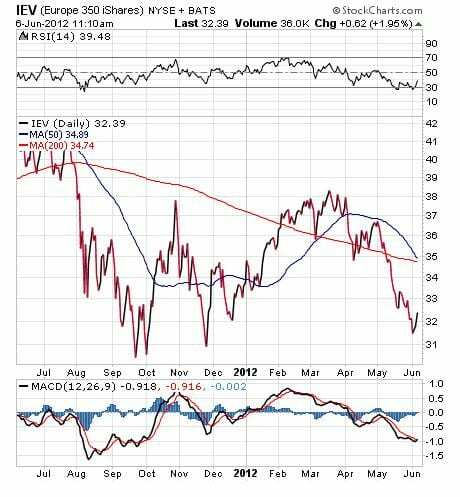 As you can see, both the iShares Emerging Markets (EEM) and the iShares Europe 350 (IEV) remain well below their long-term, 200-day moving averages. The S&P 500 has jumped back above its 200-day average during the past two trading days, but the index remains well below where it was just one month ago. In fact, the broad measure of the domestic market is down more than 6% during the past month. In the next several days, we’ll see if there is, in fact, some kind of effort by either the Federal Reserve or central banks around the globe to “stimulate” the economy. 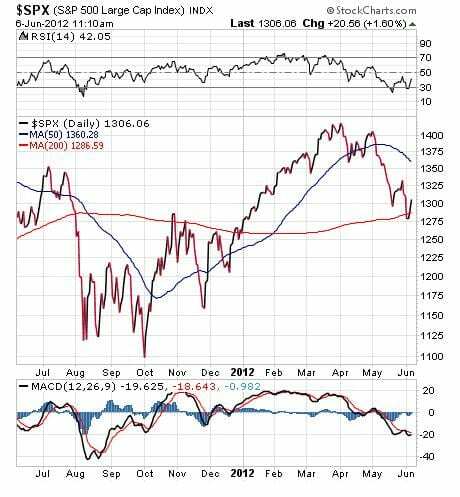 If there is some type of policy adjustment, it likely will mean a short-term rebound in stocks. It also likely will mean a bounce in commodities such as gold. Whatever happens, your key to making sense of it all will be right here, every Wednesday, in the Alert. Are We Headed for the Fiscal Cliff? I recently read an article that speculated that the likely stalemate about how to deal with a series of fiscal deadlines at the end of the year would very likely push the U.S. economy into recession in the first half of next year. This dire warning was issued by the Congressional Budget Office (CBO), which is the official budget and economic analysis arm of Congress. The CBO concluded that a wave of U.S. tax hikes and automatic spending cuts, a confluence of events they dub the “fiscal cliff,” are set to take effect in January unless Congress and the White House can agree on ways to delay or revise at least some of them. The CBO also explained that the U.S. economy would contract at an annual rate of 1.3% for the first half of 2013 if lawmakers take no action to prevent the looming tax hikes and spending cuts. Here’s the money quote from the CBO’s warning, “Given the pattern of past recessions … such a contraction in output in the first half of 2013 would probably be judged to be a recession.” I don’t know if what the CBO is warning will come to pass; however, I do know that gridlock in Washington is something we likely can take to the bank. Now, I realize this situation is something we can worry about later down the road in terms of our investing response. But I bring it up now because the way I see it, it’s never too early to keep tabs on the potential threats to your money. The “Great One” knew that in order to score in life, you have to take your shots. The hockey star was speaking both literally and figuratively in the quote above, and it’s easy to see how this wisdom from the hockey rink applies to every aspect of life. You see, when it comes to success, you have to be in the game and take your shots. If you don’t, you’re going to fail 100% of the time. P.S. Today’s challenging market conditions require even more knowledge than ever for investors and traders like you to keep pace with the latest market intelligence to safeguard your portfolio and to profit from opportunities that only may be available for short periods of time. Join me at this year’s MoneyShow San Francisco, August 24-26, at the San Francisco Marriott Marquis to hear recommendations and advice about how best to profit in 2012 and beyond! Register FREE today by clicking here, by going to www.DougFabian.sanfranciscomoneyshow.com or by calling 1-800/970-4355 and mentioning priority code 027879. Global stock markets continued their summer swoon as the Dow Jones dropped 3.60%, and the S&P 500 lost 3.52% this week. The MSCI Emerging Markets Index (MCSI) fell slightly less, ending the week down 3.27%. That said, most markets have rallied during the last two trading days, and we may have seen a short-term low.